Five years ago, Jared Oliva was faced with few options. "I knew I could play this game," Oliva said. "I loved playing this game. I just knew I kind of had a rocky path starting out." Oliva (pronounced "AH-luh-vah") was coming off his senior year at Valencia High School in California, where his abilities had gone overlooked. He received little playing time there, buried on a roster that included now-Brewers top prospect Keston Hiura as well as Colton Burns (Twins), Devin Davis and J.D. Busfield (Rays). That summer, Oliva finally got a break. He caught the attention of the University of Arizona at a prospect camp and was asked to attend a workout and meet with Arizona's coaches. Oliva left with nothing promised, but a chance to prove himself. "They offered me a walk-on spot -- no guarantees -- but I felt like I belonged there," Oliva said. "It was a big financial commitment on my family to go, because nothing's guaranteed, but we went. The coaches saw something in me, and luckily I got to develop my career out there." That leap of faith launched the career of the Pirates' No. 25 prospect. Oliva red-shirted his freshman year in 2014, then debuted with a .272 average on a team that also featured fellow-Pirates prospect Kevin Newman and Phillies infielder Scott Kingery, who had also walked on at Arizona three years prior. Newman and Kingery were both drafted in 2015. Two years later, it was Oliva's turn. "Kevin actually texted me that day -- that was pretty cool to keep it in the Pirates family -- and we're family friends with the Kingerys," Oliva said. "They're a couple years older, so actually to kind of follow-through what they did is pretty cool." The Pirates made Oliva their seventh-round selection in 2017. He signed on June 20 and embarked on his professional career four days later as a member of the West Virginia Black Bears. Oliva is the third member of his family to play professional baseball. His father, Dave, played five seasons as an outfielder in the Red Sox system, including 62 games with Winter Haven in the Florida State League in 1985. His uncle, Steven, played four years between the Braves and Angels systems. With a combined 708 professional games under their belts, both provided the younger Oliva with a sense of the daily grind of Minor League life and advice on how to take advantage of it. "The one that kind of stands out is my dad -- we're both speed guys, so he'd just talk about getting healthy," Oliva said. "Always being in the training room, getting extra stretching in, getting all the little things that will really add up during the year. That way, I stay healthy throughout the year and be the best I can be." This year Oliva has done just that. 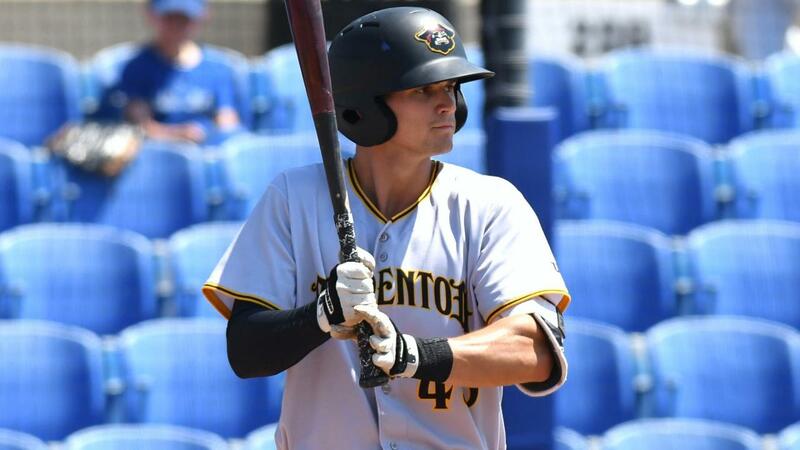 Through his first 90 games with the Bradenton Marauders, Oliva has shown his ability to hit for average (.285), skill on the bases (league-high 28 stolen bases), knack for reaching base (.368 OBP) and some emerging pop at the plate (nine home runs). "In college, I really started to find gap power," Oliva said. "This year in instructs we made a couple adjustments, and I really started to see the ball take off with a little extra something on it. But really it's just been my approach at the plate. "What I'm looking for -- am I committed, am I willing to stick with that plan, am I willing to fail? An 0-for-4 day, I'm willing to take away some positives, and really bounce back the next day." Oliva has already shown the ability to rebound from a place of uncertainty. Underestimated in high school, the 22-year-old outfielder has battled his way onto the map of the Pittsburgh Pirates. "It definitely wasn't easy, so that's why I'm very fortunate the coaches at Arizona saw something in me and reached out. It could've been a completely different story," Oliva said. "I wouldn't have it any other way. It really gave me that humble kind of upbringing. Just to see everything play out, I'm really lucky it all happened." Homer happy: Daytona's Ibandel Isabel launched six home runs in the month of July and leads the Florida State League with 23. With just over a month remaining, Isabel would need nine more bombs to match Daytona's all-time record of 32, set by Brandon Sing in 2004. The league record is 33, held by Edward Levy (Sanford, 1950) and James Fuller (Miami, 1971). Kirilloff killin' it: Twins No. 2 prospect Alex Kirilloff is on a tear through his first 34 games in the Florida State League, batting .381 with a .576 slugging percentage. A first-round pick in 2016, Kirilloff underwent Tommy John surgery and missed all of 2017, returning this year to bat .333 with Cedar Rapids before his promotion to Fort Myers on June 21. Murphy on the mark: Dunedin's Patrick Murphy enjoyed a dominant July in which the 23-year-old right-hander went 3-0 with a 1.64 ERA in five starts. Murphy walked only five and struck out 33 in 33 innings, posting a sub-2.00 ERA for the second straight month. Murphy now ranks third in the Florida State League in ERA at 2.72.